Wait a minute. I’m confused. Last week you told me a story about Lazarus. You said he died and went to heaven. Now you’re trying to tell me that Lazarus is sick? I didn’t think people got sick in heaven. Oh. This is a different Lazarus? I get it. I think.? Lazarus and his sisters Mary and Martha were good friends of Jesus. They lived in Bethany, near Jerusalem. Lazarus was sick, and his sisters sent word to Jesus to tell him. I thought Jesus already knew everything. When Jesus heard of Lazarus’ illness He said, “This sickness will not end in death. No, it is for God’s glory so that God’s Son may be glorified through it.” Jesus loved Martha, Mary, and Lazarus, yet when He heard that Lazarus was sick, he stayed where He was two more days. I bet there was good food where He was. I guess they ate all the food. Do you think Lazarus ran out of food and starved? Jesus shouldn’t go where there’s no food. I will listen. I’m just sayin’. When Jesus arrived Lazarus had been dead four days. When Martha heard that Jesus was coming she went out to meet Him. I bet Jesus brought some food with him. I’d rise from the dead if there was food. Hey, wasn’t Martha the one who made all that food when Jesus was there before? Martha left to get her sister Mary. When Mary left the house many Jews who were there to comfort her followed her, thinking she was going to the tomb to mourn there. I’m starting to get teary eyed too now. Do dogs cry? Martha doesn’t know what she’s talking about. I bet they’ll find a sweet aroma coming out of there. I sure hope they gave him some food. Thanks Chancy and Mumsy. Eating is the best part of any story. Hugs and nose kisses back to you. Oh, I’m sure they gave him lots of fish!!! 🙂 …and yes, doggies do cry! Marina, I bet Lazarus didn’t want to die ever again with all that fish. That is, unless they give you fish in heaven. 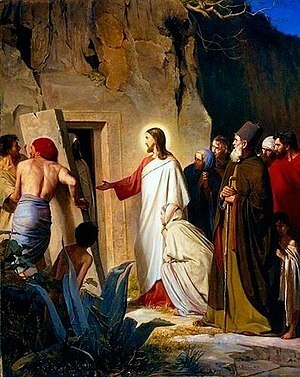 The Lazarus story is one of my favorites from the New Testament. Funny, they do talk about food a lot as well (not necessarily here, though)! Jen, the food stories are my favorite ones. But I guess being a dog I have a special liking for food anywhere I find it. Kevin, I’m glad you enjoyed it. Jesus did some awesome miracles.